Oh yes ¦ I hear it a lot: My child won't nap, but still needs one. It is that stage that we all go through, at some point. You skip their nap and they are a little bit grumpy all evening, but if you give them a nap, they are up all night? I think we ™ve all been there (or will be there) with our kids at some point. 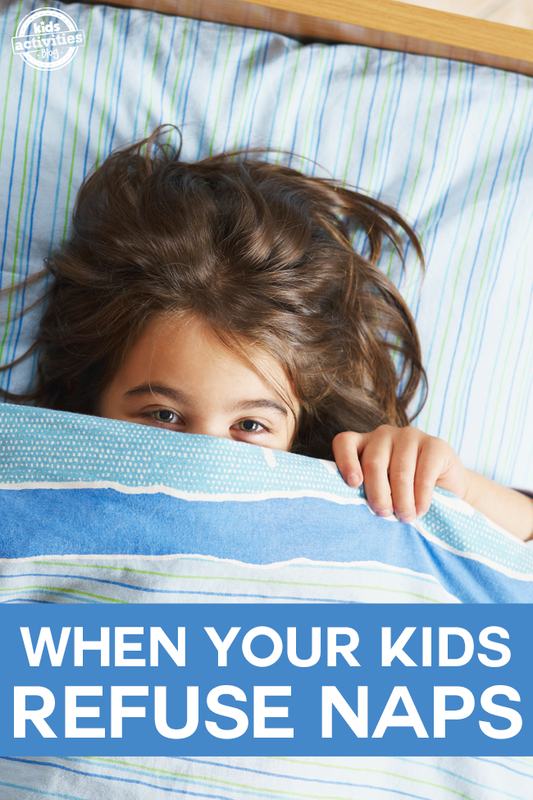 If your child is fighting nap time, there may be a reason. Think about some ways to skip nap time, but still allow your child the right amount of sleep. Today's tips will give you some ideas to try to help with your nap time woes. Good luck! Earlier bedtime. When children stop napping, they usually start going to bed a little earlier. This is a good opportunity to try a 7:00 bedtime. If they are tired sooner, try at 6:00 bedtime. You might be surprised at how they seem to still wake up at the same time that they did before they stopped napping. Take a bath and read a book in the evening to help your child calm down. This is a great tip to try before dinner. After dinner, put them to bed on a full belly. Take her for a drive at nap time and allow them to sleep for 30 minutes. Just short enough for a rest, but not long enough to disrupt evening sleep. Give lots of opportunities for outdoor play, especially in the early evening, to avoid meltdowns. Turn the old nap-time into a new bonding time. instead of insisting on napping, just insist on your child resting with you. Use this time to talk, read or sing songs together. Push back rest time by an hour and shorten nap time to 30 minutes. The extra hour awake might help them to fall asleep, and shortening the nap to 30 minutes will ensure that they still go to bed at night. Find the time when your child starts to get crabby  in the evening. Watch this for several days. Once you have found that time, put her to bed 30 minutes prior to that time to avoid her becoming overtired. I heard the best statement by far from a man on a cruise, desperately trying to get his 2-3 year old to take a nap. He said to her rest your body.  It has worked for me with my grandchildren every time. Children think they are just relaxing ¦ they hate the word nap.  ~Rebecca Covert. Let her sleep in her bed for her nap and crib for bedtime. It will make her feel like a “big girl” and coax her to fall asleep a little faster. Give your child books to read in bed (just looking at picture books keep them very entertained.) for 30 minutes. This will let her stay quiet, but not fall asleep. Distract them with fun things like a bath or reading books until it’s time for bed. In the end, you have to know your child and what you need to do to help him get through this phase. Remember ¦ THIS, TOO, SHALL PASS. Join us on our Facebook page, where we talk about parenting issues, just like this one, every day! We ™d love your opinion!